AS SEEN IN STAR MAGAZINE! Travel in true beautiful! 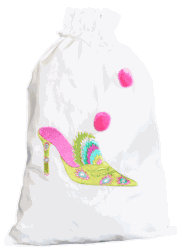 This pretty and chic cotton drawstring bag with a silky smooth polysatin lining is great for lingerie or clothing when traveling. Or use it as pretty gift "wrapping". This is so pretty, you may want to frame it and consider it art! Measures 12.5" X 17"